Opti-Free Express solution is produced by Alcon and supplied in a 355 ml bottle. It is suitable for cleaning and storing all types of soft contact lenses. Each package of Opti-Free Express solution contains a contact lens case. Opti-Free Express is a multipurpose contact lens solution produced by Alcon. One of its active ingredients, known as poloxamine, significantly increases moisture to ensure maximum comfort for up to 24 hours. 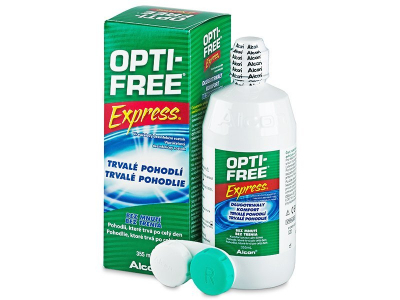 Opti-Free Express effectively cleans, disinfects, and stores all types of soft contact lenses. This package contains one 355 ml bottle of solution and one contact lens case. What is the difference between Opti-Free Express vs Replenish? Which one would be better for dry eyes? Hello Todd, Optifree Express contact lens solution is a „no-rub“ solution, meaning it is not necessary to rub the lenses in your palm before storing them. Both Express and Replenish are effective at removing deposits and relieving symptoms of dry-eye syndrome. My go-to solution. For me, it's the absolute best on the market. My lenses seem to stay hydrated and clean throughout the month. I have been using this contact lens solution for years, works well with the most contact lenses I've tried. Changed many soft contact lenses but not this solution, Alcon produces good products!